Gifted items - When Charlotte Tilbury puts her name to something, you know it's going to be good. I've had the pleasure of meeting Charlotte a number of times now and whilst I'd always been a fan of her incredible products, meeting the lady herself and hearing her talk about how much love, effort and pride she puts into each Charlotte Tilbury creation before it hits the shelves, only made me love and trust in her products even more. 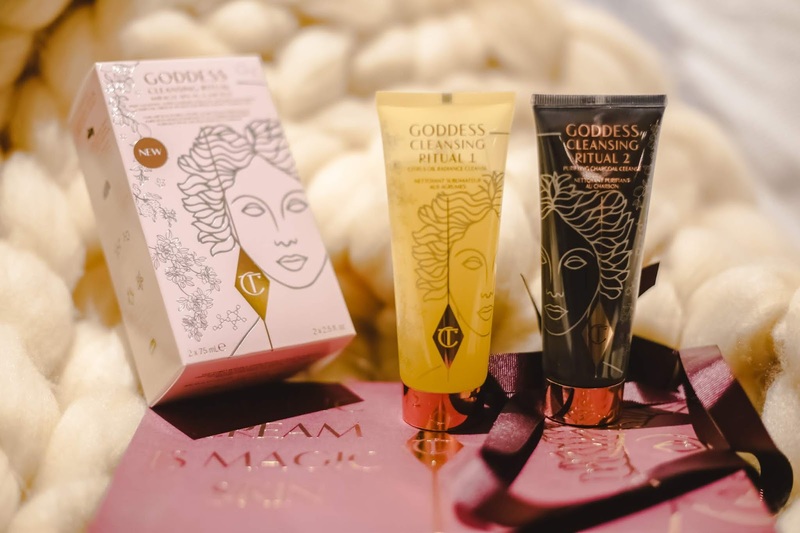 We all know that Charlotte's hol grail when it comes to skincare is her Magic Cream and today, I thought it would be good to review Charlotte Tilbury's new Super-Natural Goddess Cleansing Ritual collection (that's quite the mouthful isn't it?!). New Year, new skincare routine and all that huh? Yup. 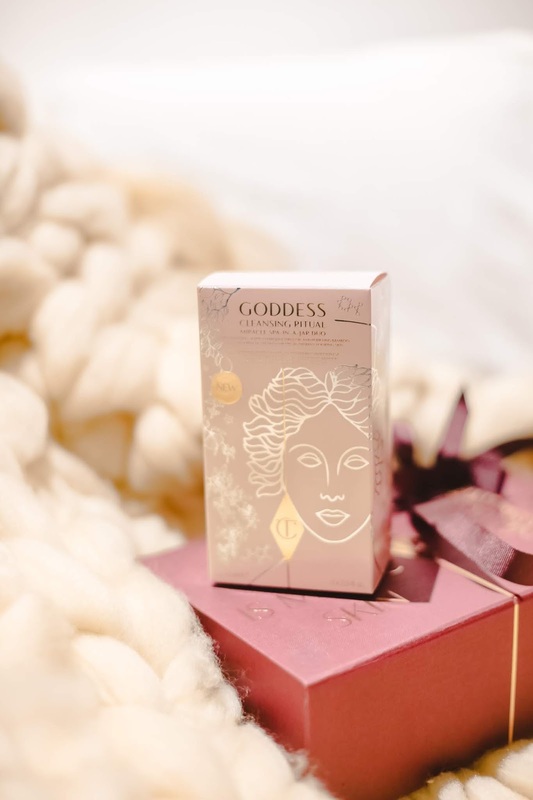 Sit down and get cosy and let's talk about Goddess Cleansing Ritual by Charlotte Tilbury. 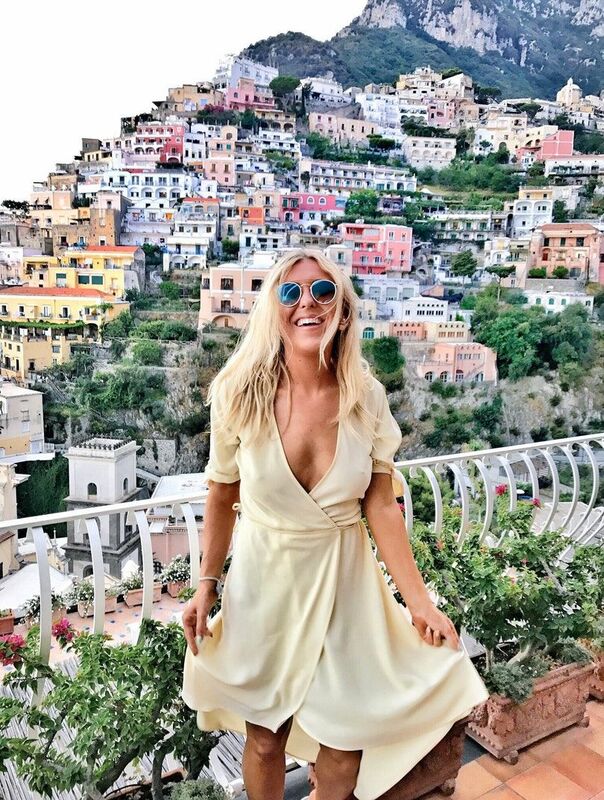 Charlotte has always believed that the key to a beautiful painting lies within creating a beautiful canvas, therefore, she believes in a good skincare routine. I'm a massive skincare lover, as I'm sure you're aware if you've been reading EmTalks for some time. 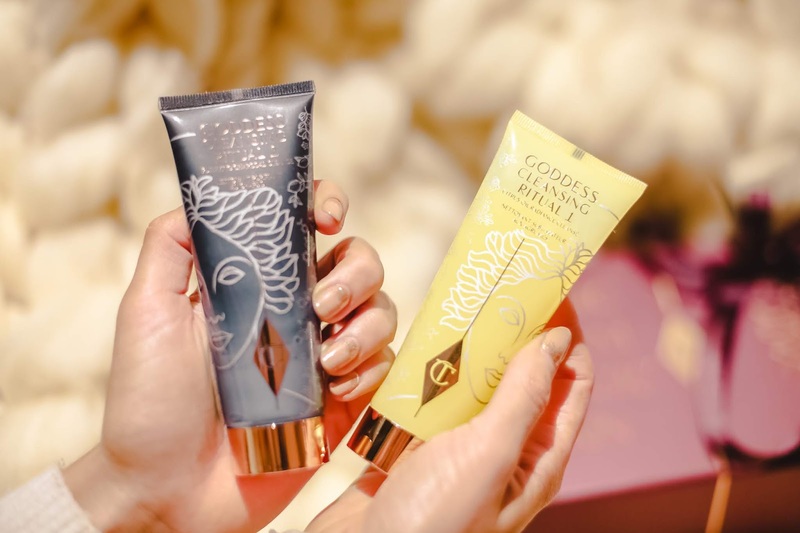 I've always been a fan of Charlotte Tilbury's iconic Magic Cream and her Glow Balm so it's safe to say I was very excited to hear she was launching a new Goddess Cleansing Ritual for well, in true Charlotte style, Goddess skin. 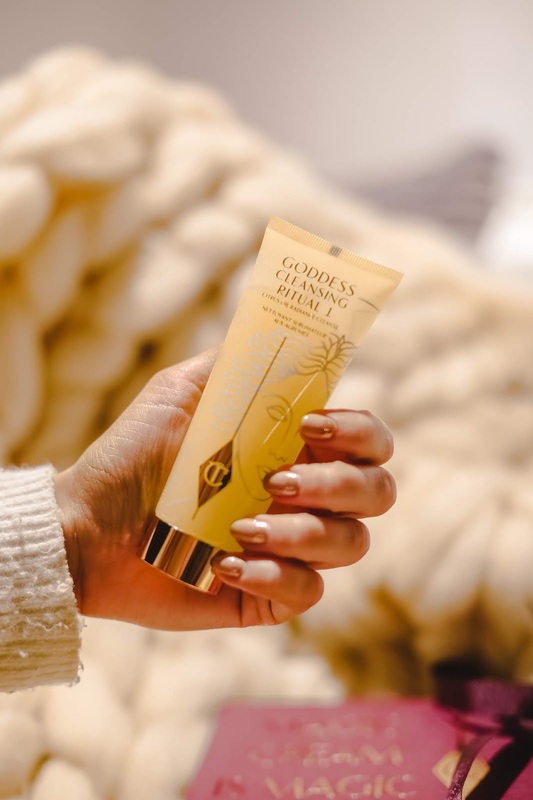 Charlotte Tilbury's new cleansing Goddess Cleansing Ritual is a two-step regime for fresh, hydrated and spa cleansed skin. So let's look at the products. You buy the products as a set of two and they come with a cloth too. Vitamin C - An antioxidant to neutralise free radicals and it also has a brightening effect which evens out the skin tone for more radiant looking skin (definitely an ingredient to look for when shopping for skincare, vitamin C is your bestie). Bacuri Butter – Which I've never heard of until now but it is a softening butter which is sourced from the eastern Amazon rainforest in Northern Brazil (Charlotte Tilbury use the best ingredients, as you can tell haha) and has a high nutritional value and is rich in minerals such as Magnesium, Zinc, Calcium, and vitamins D2, E, and K. Bacuri butter can improve skin barrier function whilst nourishing and moisturising the skin. Sounds good to me, let me lather that on. Inca Inchi Oil - This is an oil that's meant to improve dryness and loss of barrier function. It contains one of the highest amounts of polyunsaturated fatty acids that make this the ideal oil for the complexion. I genuinely am into the science when it comes to skincare and I love seeing new ingredients be included in products. Kalahari Watermelon Seed Oil – Is an oil that is naturally rich in linolenic acid and is packed-full of Vitamins A, C, and E. It is meant to balance, moisturise and brighten the appearance of the skin, and the light nature of the oil is very light means it works with oilier skin types as well. Rose, Bergamot and Lemon Essential Oils – Even the scent in these products are natural which is great as I find fragranced things don't always work well with my skin, the products use a blend of essential oils give a fresh, delicate scent. Rose oil promotes calmness, bergamot is an enlivening scent, lemon oil vapour can help eliviate the feeling of stress. I love that they even have ingredients for stress inside this product, it really is like an at home spa treatment. 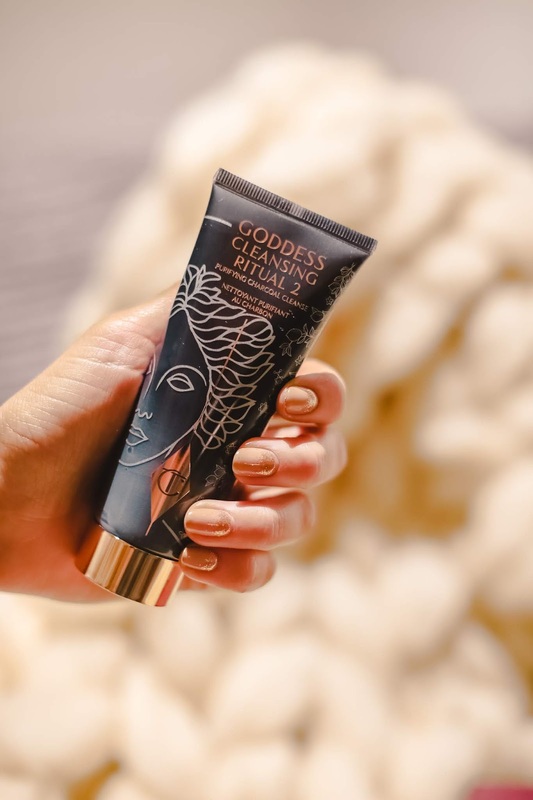 Charlotte Tilbury Goddess Cleansing Ritual 2 - The second step of this cleansing regime is a deeply-purifying, bamboo charcoal solution, to target deep-set impurities. I love it as it looks like a mask on the skin. The idea is that this will purify the complexion, unblock the pores and leave the skin feeling more balanced but it uses super-natural ingredients which I'll do a break down of below too so it's less harsh on the skin. Bamboo Charcoal - This has been used for purification and detoxifying purposes for years and years but we've definitely seen it come back around in the beauty industry over the last few years. It's rich in nourishing calcium and magnesium and bamboo charcoal has unique ionic and textural absorption properties similar to a magnetic sponge, due to its microporous surface, enabling it to entrap impurities and environmental dirt. It behaves energetically using the magnetic attraction of negatively charged ions that come into contact with positively charged dirt. How incredible and slightly terrifying does that sound in your skincare haha? and fatty acids that help re-establish the skin’s natural pH balance, replenishing and nourishing the skin. This is an ingredient I haven't heard of until now but it may explain why my skin looks so fresh after using this product. Vitamin B3 - This improves the barrier function of the skin. It helps to reduce the appearance of wrinkles, pore size and reduce the appearance of blemishes helping improve the clarity of the skin. So there we have it, such a huge, incredible list of ingredients in these cleansers and it sounds from the ingredients as if these cleansers are pretty mighty. Whilst it may seem complicated, it's just a simple two step routine where you massage the oil cleanser onto the face and around the eye area, wet a muslin cloth (which comes with the products) and apply to the face to melt off your make up. This is where it actually feels like a spa experience! If you want a steam-clean you can press the cloth onto the face for 20 seconds too to open the pores. You then massage the charcoal cleanse into your wet face until it turns white and then wash off with the muslin cloth. Tadaaa, say hello to fresh, energised, glowing skin (and it smells great too, bonus). This range is designed to rejuvenate, refresh and nourish rather than strip the skin. Charlotte said people usually use drying cleansers that dehydrate the skin and specifically designed this to melt the make up off whilst gently moisturising too. So my thoughts? At first, I was a bit confused as to why it's sold as a two step as most brands market things as a cleanser and then sell the second step as a mask for example but actually, the fact you can buy it as one set for £32.50 is very affordable in comparison to others. Charlotte Tilbury could easily charge that per bottle and I'm impressed that they haven't and instead have sold this as a nice little duo, it definitely makes it feel more special and means you get a lot more power out of your products. I do a 2, 3, 4 and sometimes 5 step routine every day on my skin anyway, so a 2 step routine is really no different. I love any balm like product to make my skin feel smooth and often, charcoal breaks me out but this isn't as harsh on my skin as some charcoal masks have been. It's worth trying products for at least 4 weeks first as your skin can break out to new products. The verdict? I couldn't be more impressed with the ingredients within these products, Charlotte Tilbury has taken a base product we all know and love (coconut oil) and added her sparkle to it to ensure it's jam packed with goodness for our skin. Say hello to your glow! 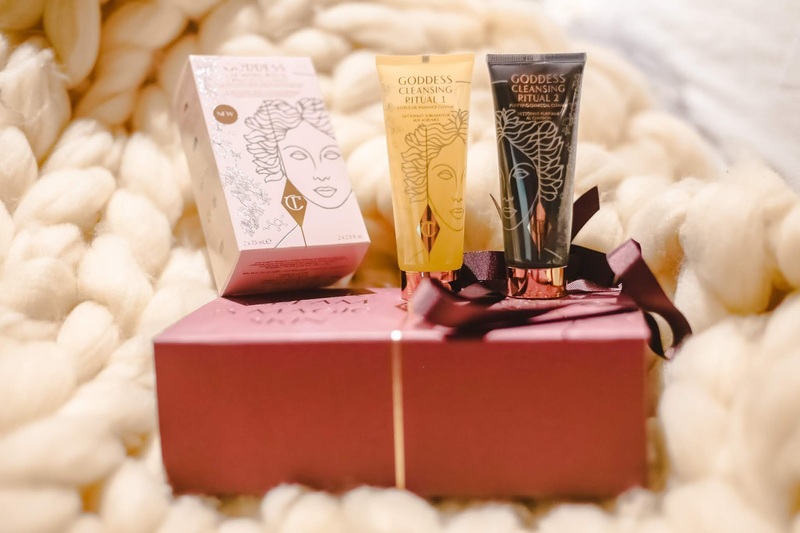 You can buy the Charlotte Tilbury Goddess Cleansing Ritual (2 bottles and a muslin cloth for £32.50) online here now. Are you into trying new skincare? Which are your favourite Charlotte Tilbury products? Do you like the sound of these?